Also note that the sets come with cardboard mats and you may optionally make the sand on the mats be this "quick-sand" or not. I would love to have agreed upon rules for this new terrain. This would be similar to "slippery ice" or "heavy snow" in that each map that uses the terrain can make the rules optional, but it should give map-makers a new terrain to design around. Eventually I'd like to see a C3V "master set" that uses AotP figures but also maps/scenarios with terrain from the sets using these rules. Again, maybe an already made group either C3V/C3G or BoV or other map-making group could do, but I figure I'd rther have this as a public discussion. So lets start on 1 and 2. GO!!! When you move to quick-sand space from a non quick-sand space, quick-sand must be counted as two spaces when moving. Nerfed version of Heavy Snow that some people house-rule. Last edited by lefton4ya; April 12th, 2019 at 10:30 AM. Eventually I'd like to see a C3V "master set" that uses AotP figures but also maps/scenarios with terrain from the sets using these rules. On the topic of the terrain specifically, I actually think that the MtG tiles look like sandstone personally, which doesn't have any effects that immediately come to mind. Quicksand feels like it would be one of the thin tiles to me, if that makes sense. 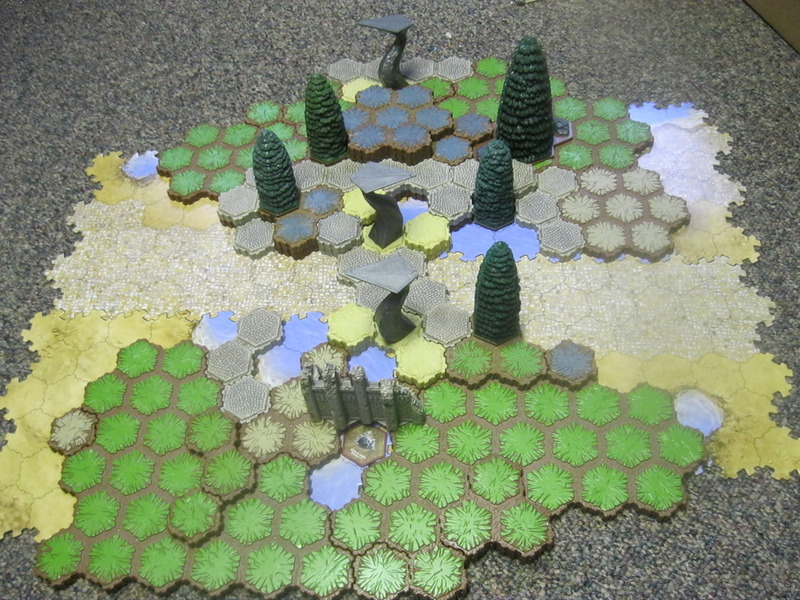 That said, I did actually have some custom Quicksand terrain rules that I was toying with a long time ago. It's very similar to 2 and 3 from your second post, but with the added caveat that you add that figure's height to your roll. Rolling below an X would either cause a wound or get your figure stuck, but with the added height to your roll larger figures are punished less. Looking through this thread, there are a few good ideas. I like something simple like, "Figures starting their move on quicksand spaces subtract 3 from their move." As long as you keep moving through it, you're fine, but if you stop it becomes a struggle to get out. Could also maybe add something like "Figures on quicksand spaces cannot target non-adjacent figures for attacks." so ranged figures can't just otherwise essentially ignore the effect. If I had to vote on the currently suggested rules I would go with the ones suggested by @lefton4ya and @Astroking112 . I think if we are involving the d20 that is the correct way to go. I like the way you add the character's height. I involved height in a different way, as you will see below. I like the idea of quicksand being mostly harmless, yet sometimes deadly. I also think it should affect anyone passing through, rather than only when you begin your turn on it. Moving through quicksand should be a risk/reward based gamble. When a unit tries to leave or ends their turn on a quicksand space, roll a single combat die. If you roll a Skull, that units gains a Sand marker*. Repeat this process until no skull is rolled. Before moving out of a Quicksand space, your unit must spend Movement to remove that many Sand markers. As long as a unit has a Sand marker, it cannot move away and cannot attack non-adjacent figures. Quicksand tiles counts as Sand spaces for the purpose of special powers. If the number of sand markers on a unit are equal to or greater than its Height value, and that unit has no more Movement to spend, that figure is destroyed. Soulborgs, Elementals, and Undead are unaffected by this ability. *Note: Sand markers are similar to wound markers. This means that Hero figures can put markers on their Army card, while Squad figures should put the markers by their bases. Markers can be represented by dice or another indicator, as agreed upon by the players. Increase the Sand markers to 2 per skull rolled. Increase the Sand markers to 2 per skull or shield rolled. Re-roll on either a Skull or a Shield. As an additional rule, and specifically for the more deadly scenarios, it may be a cool and thematic addition to allow friendly units to aid figures caught in Quicksand. Instead of attacking, a friendly unit adjacent to a figure with Sand markers may choose to remove up to 2 Sand markers from the affected figure. Figures with Sand markers may not activate this ability. When a unit tries to leave or ends their turn on a quicksand space, roll a single combat die. If you roll a Skull, that unit gains a Sand marker. Repeat this process until no skull is rolled. Before moving out of a Quicksand space, your unit must spend Movement to remove that many Sand markers. As long as a unit has a Sand marker, it cannot move away and cannot attack non-adjacent figures. If the number of Sand markers on a non-Soulborg, non-Elemental, Non-Undead unit is equal to or greater than its Height value, that figure is destroyed. Instead of attacking, an adjacent friendly unit without Sand markers may choose to remove up to 2 Sand markers from an affected figure. .
Last edited by Skyver; April 12th, 2019 at 02:39 AM. That's way too complicated and markers don't go on individual figures. It sounds worse than it is. It might be possible to shrink down though. In AotP, wound markers for squads go on individual figures. I don't know if any squads in HeroScape have more than 1 life, but if they do I imagine they would be handled the same way. Anyway, this was just my take on it. My second choice would be the d20 rule by @lefton4ya . Last edited by Skyver; April 15th, 2019 at 10:59 AM.